Surgeons have used a robot to operate inside the eye and restore sight - in a world first. A team at Oxford's John Radcliffe Hospital used the device, controlled via a joystick, to remove a membrane one hundredth of a millimetre thick. Patient Bill Beaver, 70, a curate in Oxford, said it was "a fairytale". Surgeons hope the procedure will pave the way for more complex eye surgery than is currently possible with the human hand. The BBC had exclusive access to the procedure. Dr Beaver said: "It's almost the world of fairy tales but it's true. I'm just fortunate that I'm the first to have it." Prof Robert MacLaren from University of Oxford, who led the procedure, told me: "Operating at the back of the eye needs great precision, and the challenge has been to get a robot system to do that through a tiny hole in the wall of the eye without causing damage as it moves around. "Most robots in theatre are big, with big engineering whereas this is tiny - everything had to be shrunk down." The Preceyes surgical robot was developed by a Dutch company, a spin-out of Eindhoven University of Technology. The robot, which acts like a mechanical hand, has seven motors and is able to filter out hand tremors from the surgeon. Large movements of the joystick result in tiny movements of the robot, and if the surgeon releases their grip any movement is frozen. Dr Beaver was officiating chaplain to the Household Cavalry Mounted Regiment until last year. In July his optician spotted a membrane growing at the back of his right eye. The pressure had created a hole in his retina which was destroying his central vision. Before his surgery said: "When I hold up a book, all I can see is mush in the centre, and my vision in that eye is restricted to the periphery." He underwent the pioneering surgical technique at the end of August. Prof MacLaren said: "Normally when we do this operation by hand we touch the retina and there is some haemorrhage, but when we used the robot the membrane was lifted cleanly away." The result is that Dr Beaver's central vision in his right eye has been restored. A gas bubble in the eye means he is currently short sighted, but normal distance vision will return in the coming months. Dr Beaver said: "The degeneration in my vision was very scary and I was fearful I would lose my sight entirely - so for this intervention to take place so effortlessly is a real godsend." Twelve patients will undergo surgical procedures using the robot, in a trial funded by the NIHR Oxford Biomedical Research Centre. Additional funding is being provided by Zizoz, a Dutch charity for patients with choroideremia, a genetic form of blindness which might be a future target for treatment using the robot. The trial is designed as a proof of principle, to establish whether the robot can do what an eye surgeon does, but with greater accuracy. But the ultimate goal is for robotics to take eye surgery to another level. Prof MacLaren said: "There is no doubt in my mind that we have just witnessed a vision of eye surgery in the future. Oxford is among several centres around the world which are trialling retinal gene therapy - a new treatment to prevent blindness. Currently this treatment is done by hand, and further interventions involving stem cell injections are planned which require cells to be slowly infused into the eye. The robot should allow surgeons to inject cells under the retina over a period of 10 minutes, something which would be impossible with the human hand. 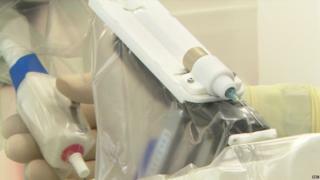 The Dutch company which developed the robot believes that it could eventually be used outside the operating theatre. Maarten Beelen from Preceyes said: "In the future we could see this being used in an office based setting, where only the robot would touch the eye and it would be fully automated, which would improve efficiency and reduce costs." The robot system is a prototype and as yet the company has not revealed what it will cost to purchase.